Rarely when I flick through the movie channels will I find something of merit that I haven't already sought out and seen. So when I stumble upon something like Easy A its worthy of a blog update. To be honest, the promos did nothing to motivate me to want to seek this movie out. Even so, I think the last time I was this surprised by a movie in this genre I bumped into The Girl Next Door in 2004. Its nice to be reminded that the ingredients of a solid story, good acting and excellent script is all that a picture needs to be successful. On the surface, this movie demonstrates that lies, no matter how innocent or genuine their intentions, can quickly get out hand. Yet it is the lies and the selfless motivating factors that make the journey of this film so interesting. The dialogue is John Hughes meets Aaron Sorkin; witty, sharp and perhaps too high brow for the high-school characters. I am not going to complain about this though as any decent dialogue is always invited. 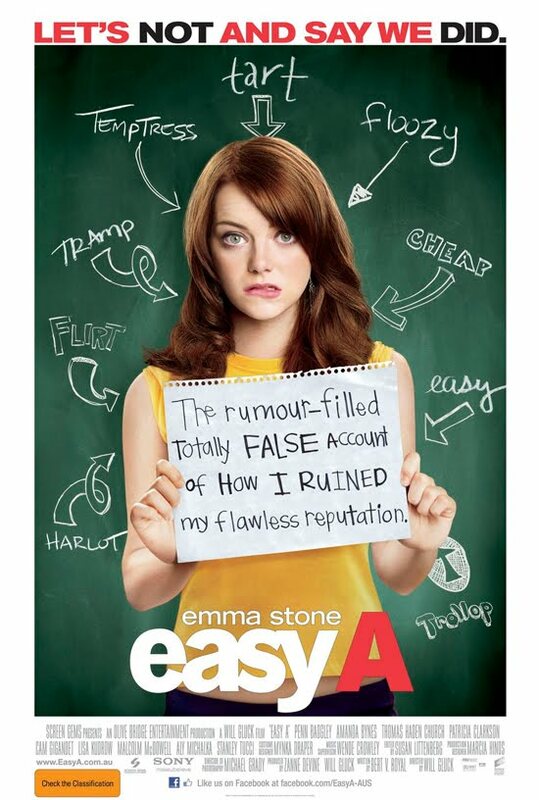 Now let me draw your attention to the rising star of Emma Stone. After seeing her in Zombieland I chalked her likable persona as characterization and good writing. However when you look at the full picture of her film repertoire we find that she has pulled this devil may care personality off more than once. In this and prior roles you get the feeling that her characters can handle any obstacle with sarcastic wit, confidence and charm. This leads me to believe that she has successfully carved out the female equivalent to the Matthew Broderick persona, that perhaps we can enjoy for years to come. With this she stands to risk the typecast curse, but who will argue that John Cusack or even Bill Murray didn't benefit from the ultra-cool, sarcastic mellow comedic typecast roles. Perhaps she is not all that, as the track record can not yet support it, but I can guarantee that script willing she will at the very least be interesting and breathe likability into her characters. So check this one out I believe you will be happy with this take on an often boring genre.